A week before the first day of class, university freshmen and their families set about moving into the dormitories at the University of Texas Rio Grande Valley campuses this week, as the new school year gears up. 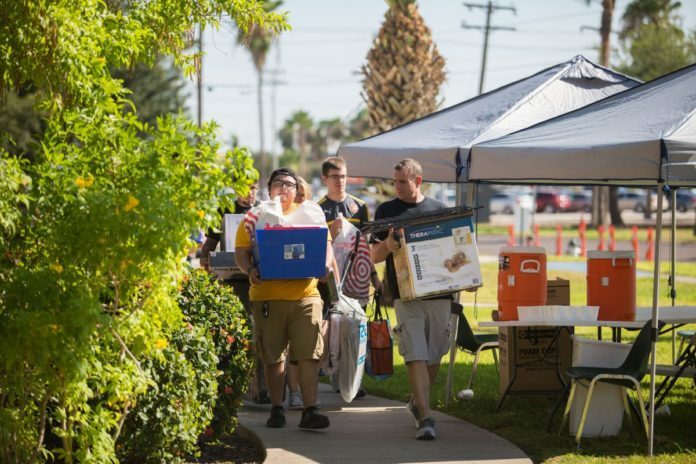 Vaquero Move-In Days are Aug. 23–25 in Brownsville and Edinburg. Sergio Martinez, director of residential life, said about 900 students are moving into university housing this semester. Students and their families carried boxes, containers, backpacks, televisions and decorations into the dormitories at the University of Texas Rio Grande Valley campuses this week, as the new school year gets underway. Vaquero Move-In Day was Aug. 23-25 in both Brownsville and Edinburg. Sergio Martinez, director of residential life, said about 900 students moved into university housing. “My advice to the students moving in is to not be afraid, to ask questions, and get out of your comfort zone by getting involved on campus,” he said. Edinburg native Paul Silva, who started moving into his dorm at Unity Hall in Edinburg on Thursday, is taking Martinez’s advice. He said he would like venture out and see what is available on campus. The mechanical engineering major said one of his expectations is learning to live on his own. Silva’s father, Alex Silva, was helping his son settle into the dorm. He said the dynamic will change at home, but he does hope his son gains a new degree of confidence. Rio Grande City native and communication sciences and disorders major Gabriela Corpus is also moving into the UTRGV dorms. Her mother, Patricia Corpus, helped her get settled. And while she said she is proud of her daughter, she is also emotional about it. “I’m sad because she’s not going to be at home. But I’m also excited for her because it’s a change. She was waiting for this. She’s very excited, so I’m excited for her,” she said. Bianca Mendez, a 2018 graduate of UTRGV’s Math and Science Academy, is moving into the Casa Bella dorms in Brownsville and is excited about living alone for the first time.